Early Medieval Monastic Sites is part of the Tentative list of Ireland in order to qualify for inclusion in the World Heritage List. As a tourist travelling Ireland you will see plenty of monasteries across the Ireland. Most are worn down and in ruins nowadays. And while it is easy to blame the constant rain as culprit, the ruins are a testament to the long history of Christianity in Ireland. Never part of the Roman empire, Christianity spread there already in the 5th century. 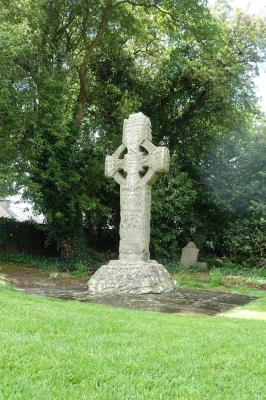 Kells: The Kells High Crosses are probably one of the most iconic images of Ireland. Combined with the Book of Kells, on display at Trinity College, they are a key part of Irish cultural identity. There is also an original nunnery remaining near the church. The keys are with a neighbor, but I couldn't find the right door bell and it was raining cats and dogs, so I rather quickly gave up. Glendalough: Located in a beautiful valley on a lake, this site has a different feeling due its church tower still rising high. Very pretty. And very popular with day tourists from Dublin. Clonmacnoise: The best. See my review as the site is also listed as a separate tentative site. As pointed out in my Clonmacnoise review I have little doubt that Irish monasteries belong on the list. To me the question is just between inscribing the best (from what I have seen Clonmacnoise) or a serial nomination of several monasteries (Early Monastic Sites). Interestingly, this nomination also happens to include Clonmacnoise, so the Irish would inscribe their jewel in any case. Unfortunately, neither nomination is progressing much. I am not sure why. Getting to Kells is fairly straightforward. You can take direct buses from Dublin. Glendalough is fairly touristy and there seem to be daily buses. But it's probably best served by car. For Clonmacnoise, again see my review. Kells is fairly close to Newgrange and a different monastic site, Monasterboice. Along the road to Kells you will pass another tentative site, Tara, a location in the Royal Sites of Ireland. Glendalough is embedded in a valley between hills. If you drive up the hills you will get to the Wicklow Gap and have a great view. The scenery itself is quite surprising as the hills rise up quite a bit compared to Dublin. On my first international trip many years before there was such a thing as Unesco World Heritage sites, I bicycled up to this area from Dublin and stayed atvavyouth hostel across the road from the Monasterboice site. It was a lovely site and the monasteries, dedicated to group work, prayer and scholarship far from the remnants of "civilization" were quite well preserved and signed, right down to the sink (lavabo, Latin fans) in the kitchen. As the rational notes, this group focus differs from those of the other early Christian monastic sites.